Safe, defensive driving practices can prevent many auto accidents from occurring, but sometimes an auto collision happens due to something beyond your control—for example, black ice on the road, wildlife running in front of the car, or the bad choices of another driver. Knowing what to do in a collision can help reduce the stress levels that are likely to be running high, and can even save you money when it comes time for auto body repairs. Regardless of what happened or how it happened, human life and health is always the top priority when an auto collision occurs. If you or anyone else involved has been hurt, call 911 for medical help immediately.Even if the injuries do not appear to be serious, you don't know what internal injuries may have occurred. You can sort it out with insurance later; get help now. Once you have seen to everyone's health (including your own), the next priority is to get a police report. This is essential to proving to the insurance companies who is at fault, especially if the collision involves another vehicle. Even if it's a minor “fender bender,” don't skip this step because it can prevent lots of arguments with the insurance companies later on. Call the police, and don't allow the other party to leave until the police get there. A camera phone is extremely useful in situations like this. 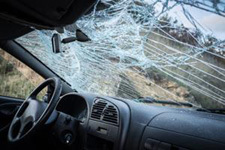 Take lots of photos of the damage to the vehicles involved, because this serves as evidence of the damage and helps the insurance companies determine who will pay for collision repair. Also, exchange contact and insurance information with the other parties, and get a copy of the police report. The more you document what happened, the more solid your case will be, especially if the other person is at fault. Once you have the documentation in order contact your insurance company, file a claim, and send copies of your paperwork and photos. Do the same for the other person's insurance company. Even if the other party is at fault, having your insurance company involved can give you more clout if the other insurance company tries to weasel out of paying. When it's time to get your car repaired, it's important that the job be done right in order to restore the structural integrity of your vehicle.Choose a collision repair shop with a reputation for quality, preferably one that is I-CAR certified. You'll probably need to get an estimate before the insurance company will approve the cost of repairs. In Mansfield, TX, Auto Tech Services (ATS) Collision Repair Center is an I-CAR Gold Class certified facility with more than 15 years of proven quality collision repair and auto painting services; they can be reached for a free estimate at (817) 405-3444.